The president of the United Aircraft Corporation said time was needed to sort out certain issues related to the fifth generation fighter aircraft. Under these two programs, a preliminary stage for formulating requirements towards jets and designing its image is completed to start major design works. “Both programs are considered priority for cooperation with India,” he said. It is rather difficult to determine the completion date. “There are several issues related to the organization of the work, the terms, the cost and technical details. This requires certain time and the corresponding coordination procedure at the level of governments of both countries,” Pogosyan said. Sections of the Indian media reported that the Indian Air Force command criticised the FGFA program. In particular, Russia was accused of non-fulfilment of its promises. The Russian side said it hadn't received official claims from the Indian partners, adding that the work was going on schedule. Russia and India have set up a joint venture to design and develop the medium-payload multirole transport aircraft. Its founders were Hindustan Aeronautics Ltd (HAL), UAC and Rosoboronexport. The headquarters of the JV will be in Bangalore. Pogosyan also noted the success of licensed production of the Su-30MKI in India. “In general, the program of licensed production of the aircraft develops successfully,” Pogosyan said. A team of Sukhoi experts from Russia is in Pune carrying out a technical evaluation of Su-30MKI fighter planes. The Indian Air Force had grounded its fleet of Su-30s pending a technical review, following the crash of an aircraft last month. The Su-30 MKI, NATO reporting name Flanker-H, is the IAF’s elite fighter-bomber. It was developed by Sukhoi Aviation Corporation and built under license by HAL. 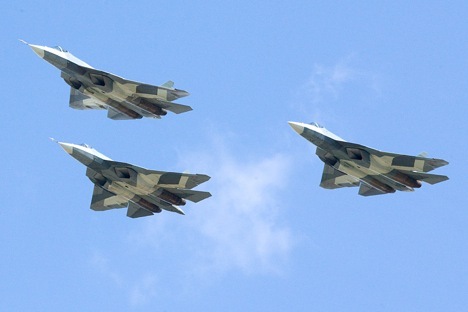 Pogosyan made the comments in the Chinese city of Zhuhai, which is hosting the China 2014 international air show China. More than 700 companies, 45 percent of which are foreign are participating in the air show. More than 120 jets and helicopters are put on display at static exposition. Russia presents around 300 exhibits of military products, including 21 life-size models.